I know the above chart is a couple of days old but there’s not much change since last Thursday. 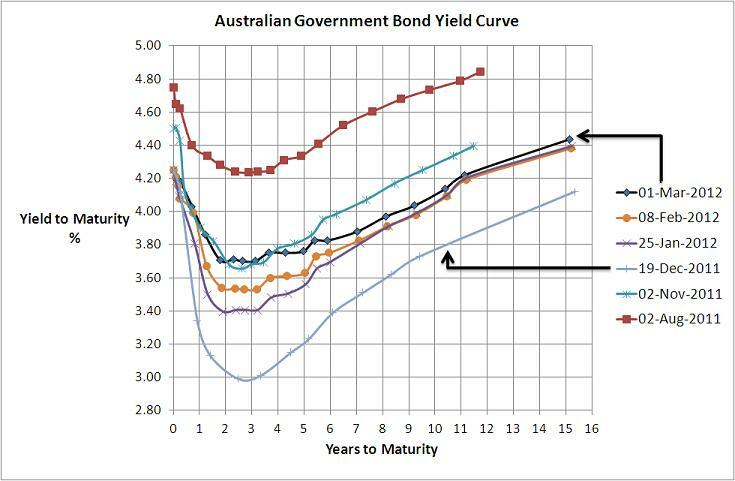 At its simplest what it shows is that the bond market is still expecting the Reserve Bank to decrease interest rates some time during the year…with 1 year bond yields at less than 4%, the market still expects at least one and may be two interest rate decreases some time this year.Despite that, results of a survey of 24 economists overnight showed that every one of them believes that rates will stay on hold today.given the stabilisation of many economic factors both here and overseas I have to agree. The big issue, of course, is still Europe and the Greek default (or whatever you want to call it), won’t occur until later this month and that could very well create some market volatility. I say that because whilst we already know what is most likely to happen there is uncertainty in terms of what will happen with Credit Default Swaps (or default insurance) that many hold on Greek debt…will they be triggered or not and if so, what will be the financial consequences in the shadow banking system….the last week of March may be interesting. Anyway, back to the chart, given bond yields bottom at 3 years and 10 year yields are still fairly low, still suggests that the Australian economy is unlikely to shoot the lights out and inflation is well contained for the moment. The creeping up of the yield curve is a reflection of a quiet month of economic news…no news is good news. Moving forward I believe the most important local economic indicator will be unemployment. Obviously Europe will have the biggest short term impact on sharemarkets, but if our unemployment level increases significantly this may flow into weaker confidence, even lower house prices, and therefore lower GDP growth. Given all of the cutbacks announced I’d be very surprised if unemployment doesn’t go up but its the sharpness of that increase that will be critical. In terms of investment its still very difficult environment. Bond yields are very low ad sharemarkets still have numerous macro risks hanging around and a low growth economic environment and high Australian dollar may limit A-REIT’s upside so its a very tough call (of course term deposis continue to pa attractive margins over bonds). My pick at the moment is volatility…I’m very confident it will increase from these curent low levels so if I could easily invest in volatility (which I can’t) then I would.